Air temperature and velocity measurements are im­portant parameters in many applications. A self-powered sensor placed in a duct and powered by an electromechanical genera­tor scavenging energy from the airﬂow has been designed and tested. It periodically transmits the measured air temperature and velocity to a receiving unit. The system basically consists of two macroblocks, respectively: the self-power wireless sensor and the receiving unit. The self powered sensor has a section devoted to the energy harvesting, exploiting the movement of an airscrew shaft keyed to a dc motor. The self-powered sensor adopts integrated devices in low-power technology, including a microcontroller, an integrated temperature sensor, and a radio-frequency transmitter at 433 MHz. The data transmission is realized in Manchester encoding, with amplitude-shift-keying modulation at 433 MHz, allowing covering a distance between the sensor and the reader on the order of 4–5 m, depending on the power supplied in trans­mission. The air velocity is measured through the rotor frequency of the electromechanical generator, whereas, for the temperature, a commercial low-power sensor is used. 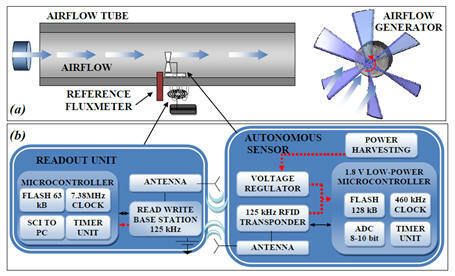 An experimental system has been designed and fabricated, demonstrating that the airﬂow harvester can power the self-powered wireless sensor permitting air temperature and velocity measurements. The system can be used for real-time monitoring of temperature and velocity. The sensor module placed into the duct does not require any batteries. Autonomous sensors are receiving increasing interest, mostly because they offer flexibility for measurements into inaccessible location. Moreover, measurement application requiring long-lived capability does not commonly match the performance of the batteries. An autonomous sensor consisting of completely embedded structures with no physical links to the outside world, exploiting power from the ambient sources is an alternative solution. An electromechanical power generator is proposed for converting mechanical energy in the form of vibrations available in the measurement environment into electrical energy. The operating principle is based on the relative movement of a planar inductor with respect to permanent magnets. A specific configuration of magnets is proposed and analyzed with the aim to improve the conversion efficiency, increasing the spatial variation of magnetic flux. Furthermore, the proposed configuration can be adopted for its low profile and modularity. Sensors inside the oral cavity!